i've been a long time lurker but finally made an acct. I have a 14 C63. Car was just aligned by Mercedes. When i drive hard and shift from 2nd to 3rd my rear end kicks out. Would this be an alignment problem or something else? It's power breaking traction. But when was the last time you had an alignment? Could be time. But when my car breaks loose it rarely ever stays completely straight due to differences in grip, camber of the road, and a few other factors. It's never done that before that's why. And i just got the car aligned from Mercedes. The only thing different is maybe the V6 tune. I'm going to rotate the tires this weekend to see if that helps. Last edited by c63prob; 11-28-2017 at 11:31 PM. If you are a base C63, the v6 tune adds a significant amount of power. Additionally, it's colder. That means more power and less grip. If you just got an alignment, it's probably fine. Have fun! ...k. I'm going to rotate the tires this weekend to see if that helps. how are you going to rotate tires. The front and rear wheels are different sizes? Yes, you cannot rotate the tires, if dealer just did an alignment, I assume they would have noticed and told you if the tires were done, I would check the tread wear, but doubt it is that bad if they did not notice it. I am going to take a shot at something. Where do you live and what is the temperature? These cars come with Summer only tires by default, it is possible someone put on all seasons, but if you live where the temperature is now below 45 F and still driving on summer tires, they get hard as a rock in the cold and and have no traction and basically you will wrap the car around a post if you are still on summers in the winter where it is cold out - any chance that is the issue? Where do you live and what tires do you have? You do NOT want to swap tires left to right on a high hp car even if they are not directional (and unless you're runnign a square set of winters, you can't swap them front to rear either because of the size difference). The steel and nylon belts in the tire carcass will "set" over time depending on the direction in which they're being twisted, and they may separate if you then start twisting the tire in the opposite direction - resulting in a blowout. I've seen it happen, so I'd strongly caution against it. If you have a Prius or a Corolla, then maybe, but not on a C63 or anything that can actually produce enough torque to spin them on dry ground. Once you've put several hundred miles on them "in anger", they always need to stay on the same side of the car (i.e. rotate in the same direction). ^^^did not know that. Good to know. Thanks. Is this not a problem if you dismount the tires from the wheels and THEN do a swap, so that they continue to rotate in the same direction? This has an added benefit if your tires show inner-edge wear from excessive toe or camber, because what was once inside edge becomes outside edge. If you are talking about taking a tire with a symmetrical tread pattern (one that does not have an "inside" and an "outside" - like a Toyo T1-R IIRC), dismounting it from the rim and putting it on the other side so that the old inside is now the outside, then yes, that is fine because the tire will continue to rotate in the same direction so you could get some more life out of them. Obviously not an option if the tires are asymmetrical (like the PSS). The temps and tune cause this. It kicks out slightly sideways because of the open diff. Check your alignment sheet to see if the camber and toe have changed. OP, like most said, if it doesnt happen often, i wouldnt worry about it too much. quite a few factors to consider including road conditions. youre driving a high powered car. it will fish tail now and again. Do you have the same kick-out on the 1->2 shift? Its called torque. It's a helluva drug. You dont even have to be driving hard at all if it is just cold where you are. Not wet, not snowing, just cold. As someone said, the tires are like bricks at that point and have no gripping qualities. OP -- If it is cold by you I would hold off on making changes to the car because it may be acting perfectly normal. However, if it does get cold by you (I would say under 40 degrees for extended periods of time) I would consider a more appropriate tire. One of the things I noticed when I got this car -after having 10 previous MB models with ESP going back to the 1986 E300 - and the evolution of ESP into more modern stability control, is the ease with which my right foot can still overcome the system. When I do it the lights flash on the dash and I can feel the system trying but I can beat it with the 481 ponies under the hood and LSD on dry pavement in 75 degree weather in C with its 2nd gear start. This was a sign I did not want the summer tires on in our colder 32-40 degree winter days and bought proper winter tires and still I can beat the system. All this talk of alignment? Is it really relevant? It would have to be out huge would it not to affect this? Would it not also be an issue at low throttle inputs as well as at high inputs if it is alignment? If it is huge is the rear movement always in one direction? Usually the rears will want to go right. Is this the case or is it going left? Thrust angle spec is 0.12 degrees max. from center in either direction My car is -0.02 just off straight, with negative being left of center. As to the tires I agree. You cannot safely move a stagger forward and back nor can you move directional tires side to side without dismounting and remounting them to retain directionality. I have never run asymetric tires on any car but the logic argued against them by others makes sense. My suggestion? If you are in a cold climate get winter tires and in winter and summer learn where the limits are because you will defeat the ESP which will destabilize the rear end and more so with and LSD. Keep in mind that in some circumstances a bit of drift can be fun. Physics will rule. Thank you everybody for the reply. Ive never owned such a beast and 1st time seeing colder weather!! It's an animal most of the time, and it gets that little bit angrier in the cold weather. It's the weather, nothing else, I can bet on it. Cars feel like they've gained a substantial amount more power in cold weather. I remember with my E55, it felt like I upgraded the blower that thing pulled so much harder in the cold once the heatsoak issue with the summer months went away in the winter months. Felt like 80HP leap, not kidding. “ALIGNMENT”.... Only front and rear ‘Toe’ adjustment is available OEM ! You can fit (for the front only) inaccurate one only position offset bolts offering a minimal 3mm (1/8”). “KICKS OUT”.... With the ‘multi link’ rear arms (6 – in addition to the 2 lower control arms) we saw the need therefore to design set of 12 replacement end link performance bushings to dramatically reduce rear end flex/twitch and resultant loss of traction – especially when applying power on the highway to lane change/overtake. Also for the rear separate patented design lower control arm inner bushings that are precisely Camber adjustable to adjust tire contact angle. Single wrench on car accurately under load – direct on alignment rack. Comes with bush extraction tool. Also includes extra Toe adjustment to compensate. For the front, similar bushings (which replace the 4 highest wearing bushes) providing ‘precise’ Camber and Caster adjustment – 3 times the adjustment range of the one position offset bolts. 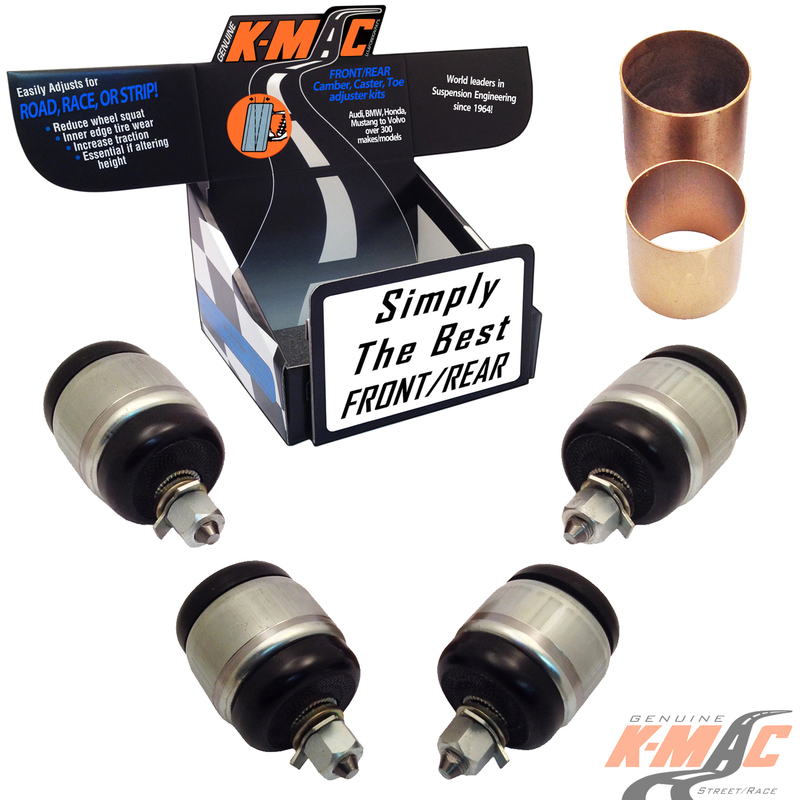 These K-MAC front bushings are 2 axis self aligning but without the OEM air void/oil filled bushings. Result is noticeably improved brake and steering response. 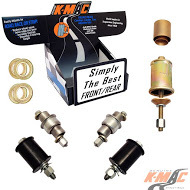 Above adjuster kits allow to cater for all driving situations encountered other than the OEM specs for showroom height: high cambered roads, altering height, fitting wide profile tires, rear end squat through load carrying or just having ongoing adjustment capability for curb knock damage. Also manufacture front replacement top strut mounts (coil spring models) Camber and Caster adjustable specially designed for track days. The patented design allows settings to be changed in just the time taken to loosen the 3 top strut mount nuts. 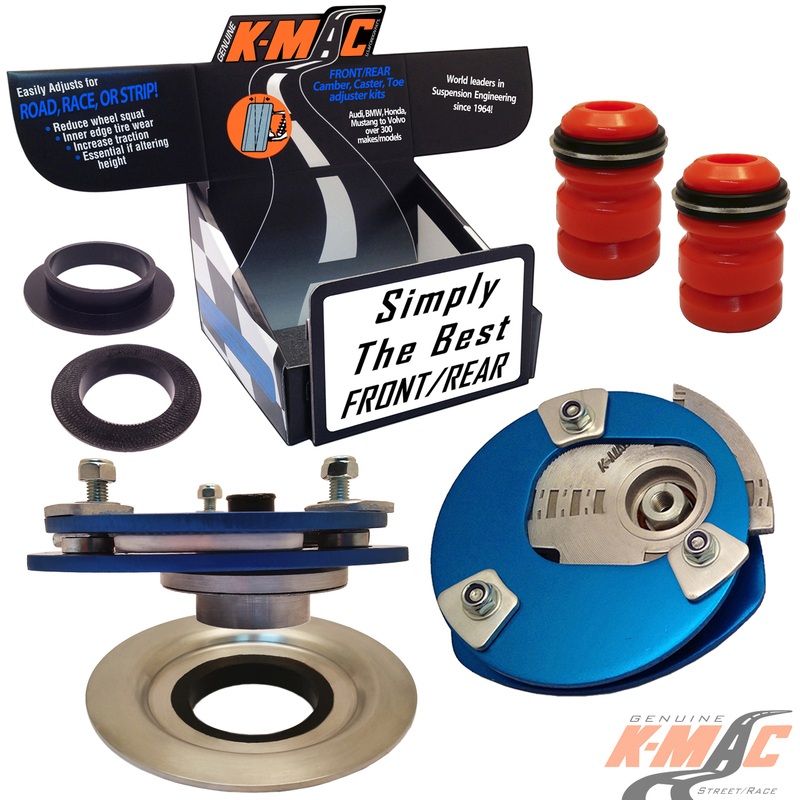 When used in conjunction with above adjustable lower arm bushings provides up to 4.5 degrees Negative camber to reduce understeer allowing to go deeper into corners with increased traction and braking response. MB World members delivery USA/Canada $30 one kit or $40 Front and Rear. I grew up in southern Ontario when winter snow was deep and regular. I learned to drift my dads orginal VW bugs at a very early age. I know how to drive in snow. A few weeks ago we had some snow here on southern Vancouver Island. The locals were referring to it as Snomaggedon. All over and inch or less of snow. I dropped she who shall be listend to off at a girl friend's apartment and drove around the back to go out the other side of the building. Now keep in mind I have winter tires, ESP etc. When I turned left behind the building it was pretty much ice. I never touched the throttle and the back end went out and the ESP was useless. I had to dump it out of gear and drag the brakes to stop idle induced wheel spin. That told me a helluva a lot about just how much of this 481 ponies gets dumped to the rear wheels. I have learned to tip toe pretty fast even in snow with this beasty. Flapping noise 25-30mph... baseball card in spokes?